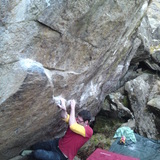 Love this problem - Been playing on it for years but put 6 focused sessions into it in recent months to send it. Tidal. No walk in. Brilliant! Pull onto the slab from jugs in the center of the block then walk rightwards to the arête, technical (and high) laybacking to the top! The obvious arête - J.Howard added the steep sit start - 7A? As hard as 2.4p on the path - one of the very few problems possible harder for the tall?